Can I Keep My Home And File Chapter 7? 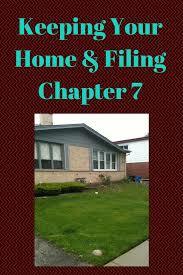 You are here: Home / Chapter 7 Bankruptcy / Can I Keep My Home And File Chapter 7? Every homeowner who is considering filing chapter 7 bankruptcy, understandably wants to know whether or not their house is going to be protected if they file for bankruptcy. In most cases, the home is going to be protected through the process. This is mostly due to the fact that there is not significant equity in the real estate. Equity equates to the ownership portion of the property. For example, if you have a house with a market value of $400,000 and an outstanding mortgage balance of $300,000, then you have $100,000 worth of equity in the property. In Illinois, you as an individual filer are able to protect up to $15,000 worth of equity in your real estate. In the case of a joint filing, husband and wife, the couple can protect up to $30,000 worth of equity in the real estate property. In reality, you could have some additional equity and still be clear from the long arm of the trustee in many cases. When you file for chapter 7 bankruptcy, the trustee assigned to your case basically can stand in your shoes. So if there is equity in the property beyond your exemption amounts, the trustee does have the ability in certain cases to sell that asset and distribute any non-exempt funds to creditors. The trustee has to take into account more than just your state of Illinois statutory exemption amount of $15,000 per party. The trustee needs to look at who owns the property? Are there owners on the property that are not filing bankruptcy? If so, the trustee would have to account for that non-filer’s ownership share in calculating the available equity. The trustee has to also factor in the cost of sale. The average broker’s commission today is 5%. To sell a house at $400,000, would require a $20,000 broker’s commission. In addition to that, there are the customary costs of selling real estate such as title expenses, transfer expenses, attorney’s fees, and other miscellaneous expenses related to the final closing. The trustee has to factor all of these expenses in when determining whether or not there will be anything available for creditors. For the reasons stated above, there has to be a significant equity amount above and beyond your exempted amount to make it worthwhile for a trustee to pursue a sale. You also have the ability to buy out the trustee’s interest in the event that your property does reveal significant equity. The trustee is not eager to displace you from your home. The trustee simply has a duty to liquidate any non-exempt property for the benefit of creditors. If you have the ability to pay the trustee whatever interest he could receive from the property, he would be more than willing to accept the payment. On occasion, clients have had to tap into their 401(k)’s or other retirement accounts or borrow from family members to buy out the trustee’s interest. One of the things you as a debtor can do to reduce the possibility of a trustee finding equity in an asset, is to have your property properly evaluated. This can be done through an expensive appraisal or an inexpensive comparative market analysis done by a licensed realtor. By knowing in advance of filing what the typical value of your property is, you can avoid the stress and the fear that a trustee will seek an interest in your property. Your attorney can provide a copy of that comparative market analysis or appraisal to the trustee assigned to your case in advance of the meeting of creditors. This way the trustee can see before the meeting that there is no significant equity. You don’t want to have a situation where the trustee sees a potential asset on the schedules and then starts to do his own investigation. You want to put your trustee on notice immediately that the property is not worthy of administration. Lastly, if you’re looking to file chapter 7 bankruptcy and if you have an experienced attorney, that attorney will advise you whether or not your property will be at risk if you file. Make sure that you are honest and open with your attorney. When you have your initial consultation with your bankruptcy attorney, that is not the time to devalue your property. You want to give your attorney all of the accurate facts regarding your assets so that the attorney can guide you. If you failed to disclose property to your attorney and to the court, then you not only expose the asset to risk and you may not receive the bankruptcy protection that you sought initially. The trustee can actually liquidate the asset and ask the judge to deny you a bankruptcy discharge. If you are thinking of filing for chapter 7 bankruptcy and if you have a potential asset that you feel may be at risk, contact my office for immediate help.